The secret to strong and healthy plants & vegetables is healthy soil. For your plants to thrive, your soil must contain the nutrients and microorganisms your plants need. The best way to get a detailed analysis of your soil is to complete a soil test that allows you to identify any deficiencies that may exist in it. A basic soil test is a great start, but the next step is to assess your soil further for critical qualities using a system developed by farmers and soil scientists in Oregon. The methods are simple, easy to use, and require only supplies you can find around your home. 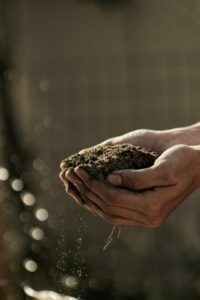 This process is called The Willamette Valley Soil Quality Guide and can be used by gardeners in every part of the country. You should use each of the following soil tips during the active growing season in the spring, but you can test for soil structure, compaction, plant residue, and tilth year-round. Wait until your soil is neither too wet nor too dry and dig a hole 6 to 10 inches deep. Pull out a section of your soil about the size of a soup can and break it apart. Examine the soil to determine if it’s cloddy, granular, or powdery. Ideal soil is made of different sized crumbs that hold their shape under pressure. It’s important to have soil that’s rich in organic matter and porous soil allows for free movement of water and oxygen. Get a piece of heavy gauge wire and stick it into your soil in different locations to test the depth. See how far down the wire goes before it bends. If it bends sooner rather than later, the soil is more compacted than it should be. Healthy soil should be easily penetrable down to at least one foot. You probably tested your soil’s workability the last time you prepped your garden for the season but checking it on a regular basis is the perfect way to determine its health level. Does it take a lot of effort to work it? Does tilling or digging produce cloddy or plate-like clumps? Is prepping the beds exhausting? If the answer to any of these questions is yes, then your soil isn’t completely healthy. The next step is to gently probe into the earth to find more shy organisms hanging out in your soil. If you count less than 10 different species, then your soil doesn’t have enough variety to thrive. don’t have to worry about your plants being burned. Worm castings are odorless, child-safe, and pet-safe. They’re proven to improve plant growth, soil structure and moisture retention. You can purchase castings in individual bags, by the case, pallet, cubic yards or in bulk. Do you have to have multiple pH levels in your organic garden? Some plants and vegetables need more acidic soil than others. Use plant markers to differentiate between the soils in your garden. Background information for this article was provided by MCB Biomarkers. Visit their website at McgBiomarkers.com.